We are sorry we didn't meet your expectations. We work really hard to get 10 points from each client. Thank you for taking the time to submit your feedback. We will get in touch with you soon. I first called Angeles Pest when I discovered nasty tiny little red biting ants in the dirt around the house. I was getting ready to have the exterior painted and didn't want anyone having to deal with that. Guy came out, was very nice and professional. He understood my concern about pets in the home and assured me the product he uses would not hurt them, even if it got inside. He sprayed, then recommended I get on a regular schedule for spring and summer, where he returns on a regular preset schedule to keep the bugs at bay. The cost was so fair I just had to say yes! More recently I found ants on the bathroom counter...Guy promptly returned my call and told me he didn't think he needed to spray, that setting traps should do the trick. And the next night when I arrived home I had 2 traps sitting on my porch, compliments of Angeles Pest. And yes, they did the trick. 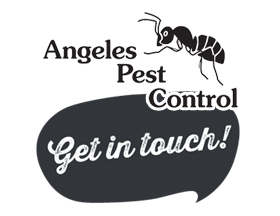 I can't recommend Angeles Pest highly enough, give them a try, I'm sure you'll agree. For many years now, I have shared my shed with European wasps. They are generally benign but beneficial creatures like honeybees except they kill and eat bad bugs instead of pollination and honey. For some reason, they allowed yellow jackets to move in next to them. I called Angeles Pest Control to get rid of the yellow jackets, but leave the European wasps alive. The nests were right next to each other so it was almost impossible for him to do so but he did his best. Some of the European wasps survived and are thriving again. Best of all, the yellow jackets are gone. They were very prompt and efficient. They did a good job. They used a natural alternative that is environmentally friendly.